The week-long Chinese New Year holiday shutdown starts this week. 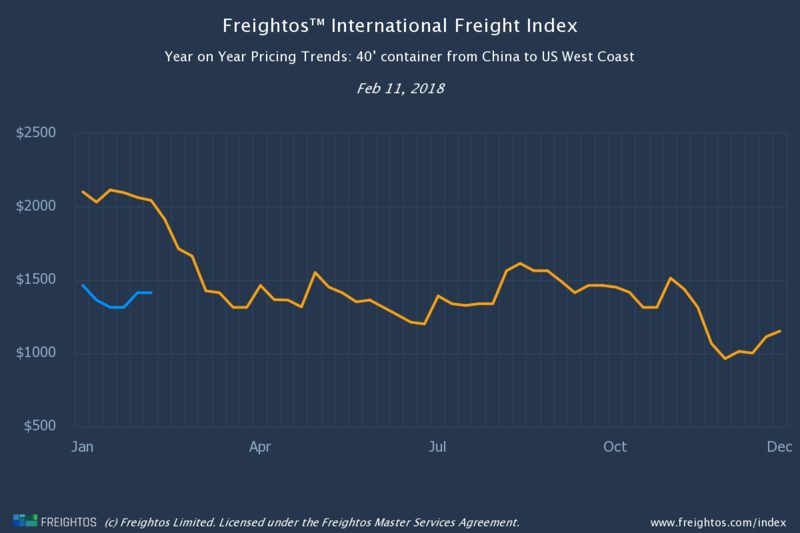 Rates though have stabilized rather than rising – an indication that most shippers planned well and have already arranged their shipments, or are prepared to wait until after the shutdown. There are fewer China-US carrier rates on Freightos WebCargo this week, pointing to more flights operating at capacity. That said, China-US air freight rates barely moved from last week, currently at $3.25-$5.00 (USD/kg). The only change since last week was a small 5c increase in average general rates. China-Europe rates are currently $3.25-$5.00 (USD/kg), and haven’t changed since last week. Europe-US rates, which aren’t affected by CNY shutdown are also unchanged at $3.25-$5.00 (USD/kg). Expect prices to fall slightly after CNY, but the biggest pricing change will be the upcoming return of promotions. Like air rates, China-US ocean pricing is also unchanged this week. In a couple of week’s time, production and shipping in China will return to normal. Whereas air rates will drop a little, expect ocean rates from China to heavily fall away. That’s because, unlike air freight, ocean freight demand is well below capacity. And that’s why the mid-February GRI round was canceled, and also why China-Europe rates, which are not affected by GRIs, fell last week. No movement on China-US routes this week. Making year on year price comparisons are misleading currently for China lanes, because CNY fell out on January 29 last year. Last year China-US rates fell strongly away soon after CNY, which fell out on January 29. This pattern should be repeated this year (refer Figure 2). FIGURE 2: CHINA-US WEST COAST RATES TYPICALLY FALL AWAY AFTER THE CNY SHUTDOWN.